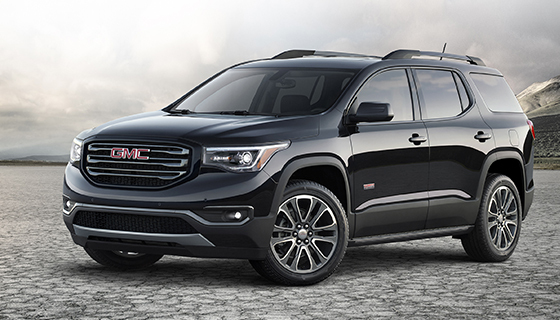 McGrath GMC would like to introduce to you the all-new 2017 GMC Acadia. Your favorite SUV in the midsized segment has been redesigned from the ground up and we have all the newest details on it’s release right here! GMC Engineers worked countless hours to offer multiple variations of the 2017 Acadia and, depending on the model, it is now available with five, six or seven passenger seating options. The new Acadia is 700 pounds leaner than the current 2016 GMC Acadia through the use of lighter soundproofing materials and an increase in the percentage of high-strength steel in the structure. Lighter SUV = Money Saved at the Pump! Also, the (now standard) 2.5L Engine, providing an est. 28 mpg hwy for FWD models. Premium design and refinement nod in approval of the cooperation of lush exterior upgrades and the always-recognizable Acadia signature layout. A few new characteristics of the 2017 Acadia include dimensional grilles and wraparound headlamps. The Acadia Denali Package features new characteristics and additional features like integrated chrome side trim, chrome-accented door handles, a chrome lower-rear fascia and specific six-spoke wheels. 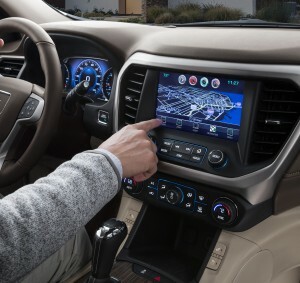 All Acadia Trim Packages have their own unique interior color and trim combinations. The interior of the 2017 GMC Acadia has multiple new features like the split-folding second-row seat. This new seating improves the original feature, the Smart Slide, which offers greater flexibility for access to the third row — it even folds forward with a front facing child seat in place! A practical addition in the 2017 Acadia is the USB charging ports in each row of the cabin, and at the rear of the center console is a unique pull-out storage drawer to keep electronics and other small necessities organized. The All Terrain Package is for those who take the road less traveled. When equipped, your All Terrain Acadia is designed to handle any off-road driving that may come your way. The All Terrain Package is optimized for traction in every condition it encounters, whether that be wet, snowy, icy, or even dry. This package even has an ‘All Terrain’ mode which works with the model’s exclusive AWD system with Active Twin Clutch to enhance your hill-climbing efficiency.